This issue we make good on the other half of our slogan, Playsets and toys from the Atomic Age and Beyond! 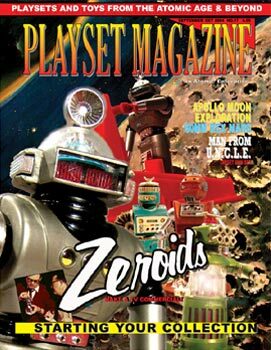 Its Spies n' Space for you, and the planet gets pretty crowded with those magnificent robots friends from Space, the Mighty Zeroids, designed by none other than Frank Rice of playset fame for Ideal in 1967-9168. These incredible beauties will transfix you with their tiny, jewel-like details, control panels and motorized power! We have all the main Zeroids plus some great, never before seen vintage photos of Frank making a TV commercial to introduce them. Then there's the awesome Marx Man From U.N.C.L.E. Target Gun Set in COLOR on our centerspread pages with its THRUSH villains VS Napoleon Solo and the repressed, but violent Illya Kuryakin. (courtesy Francis and Jason Turner and the Official Marx Museum). . .
PLUS the wonders of the future in COLOR with the Apollo Exploration playset. Here you'll feast on Jetsons-like space ships, flying saucers and space sleds galore! But that's not all -- theres new Japanese Assassins, New Replicants, a newly revised book on Britains all in review, plus a New Market Report by the always-thinking Tom Stark. And if that's not enough, we'll have some great ads, classifieds and news for your Saturday night toy fest!